If you’re looking for a notebook to write down important business information in or to take notes with, daily journals and diaries are the perfect choice. 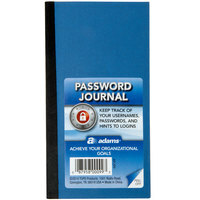 Our daily diaries have lined and dated pages that make it easy to keep your records and reminders organized. Additionally, we offer products with hard vinyl covers that protect the pages from accidental spills and dirt. For other record-keeping products, check out our binders, desk organizers, and desk calendars. If you're wondering where to buy adams journals and diaries, we have a large selection of adams journals and diaries for sale at the lowest prices.